The smashed glass panel in the door at the Park Lane Hair Studio which raiders targeted this week before making off with around 300 in charity cash. 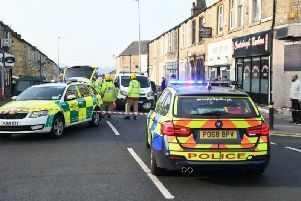 Attiq Azam discovered his shop, Park Lane Hair Studio in Burnley's Padiham Road, had been broken into when he went to open for business yesterday morning. Burglars smashed glass panels in the front door to gain entry and they helped themselves to between £200 and £300 in collection buckets and boxes for Pendleside Hospice, Great Ormonde Street children's hospital and the charity MENCAP. Attiq said: "It is devastating as that money was given by my customers to help these causes but now it has just been taken. "My customers are always so generous when it comes to helping charities and I feel so bad for them that this has happened to the money they donated." Although no equipment or tools were stolen Attiq will now be stepping up security measures at the premises but he has vowed to continue fund raising. Earlier this year he raised £250 when he agreed to have his head shaved for Pendleside Hospice. Attiq added: "They will not stop me from raising money. Places like the hospice helps so many in this area and they rely on people like myself and my customers for donations." Police are now examining CCTV footage in the area as on the same night two other businesses, Yui's Thai Kitchen, also on Padiham Road and KK's Hair Design in Harley Street were also targeted by raiders.